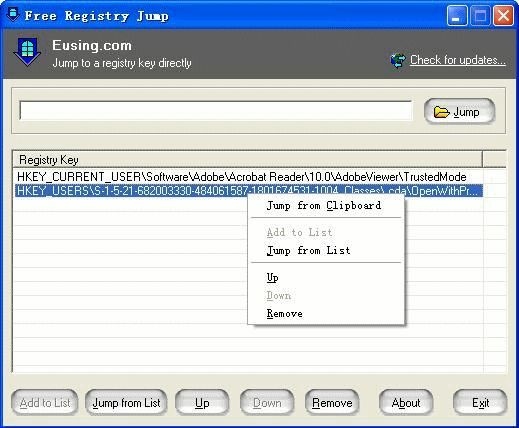 Eusing Free Registry Jump is a freeware tool that lets you jump to Registry keys directly in Regedit. Free Registry Jump enable you to jump to a certain registry key or value instantly. You can just enter the registry key or value you wish to jump to. You also can manage and directly jump to frequently accessed registry keys. Free Registry Jump accepts root keys in standard (e.g. HKEY_LOCAL_MACHINE) and abbreviated form (e.g. HKLM). It also can jump to a key you've copied to the clipboard.